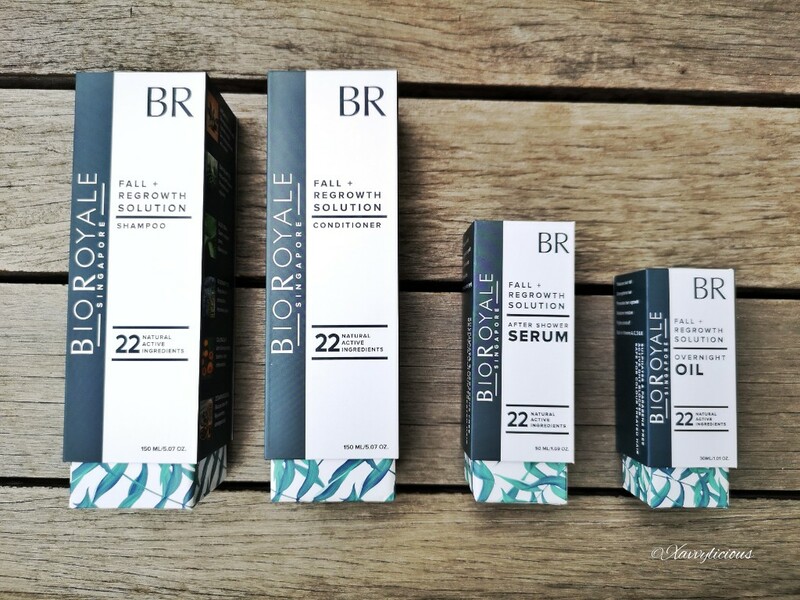 If you have read about my review on Post-Natal Hair Loss Solution in 2017 (scroll below) using BioRoyale, an Award Winning Solution for Fall + Regrowth which contains 22 natural ingredients such as Green Tea Extract, Rosemary and Argan oil! If you have been following me long enough for the past 6 years, I prefer to go for products that contain natural ingredients as much as I can as I have learnt how certain chemicals in some products are not going to be beneficial to our bodies if we are going to use it on a long term basis. The content of the products remained the same, just that the packaging had changed! I love the simplicity design of the new packaging and on top of that, the holder that was being used to box up the product is solid and firm enough to just pack into your luggage should you be travelling! 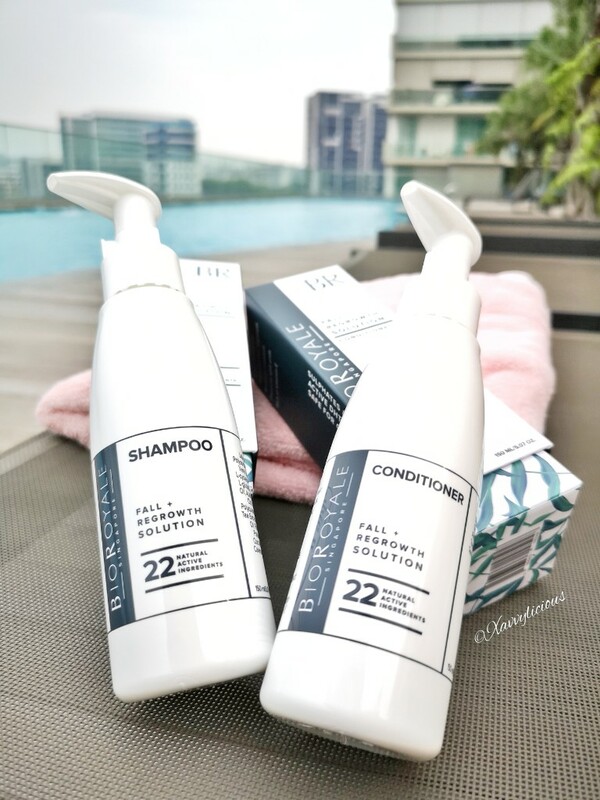 If you are still hunting around for great bargains on products to tackle your hair loss concern, here is one exclusive deal from Fitlion! They can be bought on our website and are also available on Lazada, RedMart and Four Seasons Market place (parkway parade) for consumers to buy. For Fitlion's new members, grab hold of this promotion! 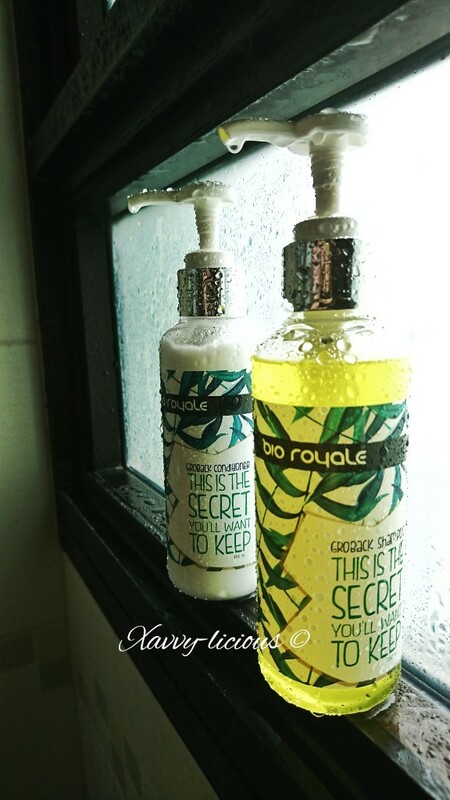 You can purchase a maximum of 2 sets of BioRoyale Fall + Regrowth Shampoo at ONLY Sgd $9.90 each and you can cart in a bottle of conditioner for $19.90 (u.p $35)! You can only purchase the conditioner at the special price only if you purchase the shampoo. This promotion ends on 30 April 2019! Do not miss out this great deal! Do not stop here, do scroll down to read my review if you have not read it. Hair loss is now the common nightmare of the both genders. I remember I wrote a post on Hair loss and scalp care like 1.5 years ago ? Apart from the various factors that was mentioned in the hair loss and scalp care post, do you know that the quality of water which we use to wash our hair also have certain effects on our hair ? Now, take a moment and think back if you have experience this. Whenever I travel, I will never fail to bring my own shampoo and conditioner. However, in certain countries, my hair felt different despite the fact that I am using my usual shampoo and conditioner to wash it. Yes, it's the quality of the water and do not be surprise that the quality of the water does contribute to our hair loss. This time, my mane was pampered by BioRoyale GroBack Shampoo, Conditioner, After shower serum and Overnight Vitalizer. I have oily hair scalp by nature and usually by mid-noon, my scalp gets oily and my hair starts to lump together especially at the fringe. Not all scalp care shampoo suits me or can be use daily. I bought a certain brand from my usual hair salon and my stylist advised me to use it only once or twice a week, just to clean my scalp but not on a daily basis as it might be too harsh on the scalp. An over-drying scalp can resulted in me having an itchy scalp. So how do I choose my skin and hair care products ? I try to choose products with natural ingredients, parabens free and sulphates free mainly because parabens and sulphates are the main chemicals present in most shampoo that cause hairfall. Do READ THE LABELS when you are shopping for your shampoo. Bio Royale with 20 years in the making of natural hair products, came up with this awesome set of 4. Locally made and produced in Singapore and it is approved by Health Science Authority of Singapore (HSA). Bio Royale contains natural ingredientssuch as Aloe Vera, Arnica Extract, Calendula, Buccopa Muneri, Tea Tree Oil, Cedarwood oil, Green tree extract, Cochlearea (anoracia) and Argan oil, it also contains Saw Palmetto that helps to regrow hair and blocks DHT (Dihydrotestosterone) - main cause of male pattern baldness, which is so common nowadays, even so for males who are in their early 30s. 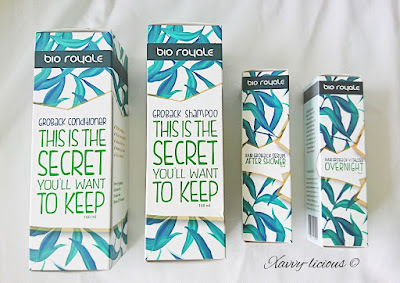 My overall experience after using Bio Royale GroBack Shampoo and Conditioner - The shampoo was mildly scented of the natural ingredients while the conditioner was easy to rinse off. Normaly, I will blow dry my hair and quite a number of strands on the floor could be sighted after that. When swept together and rolled into a ball, the sight can be quite disturbing. My hairfall during shower and drying had a significant improvement after a week of using Bio Royale. Imagine, further damage done to my coloured hair with the daily blow-drying but somehow the conditioner, which is rich in Vitamin E helped to retain the moisture. 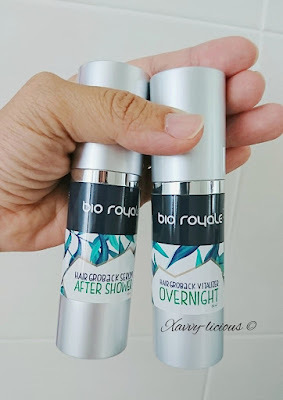 I could run my fingers easily while I blow dry as compared to the norm and not forgtting my scalp, the oiliness was in control. To aid with the oil control, I massage a few drops of After Shower Serum into my scalp. Remember this tip, regardles of what products you are using, it is very important to massage and stimulate the hair follicles. Otherwise, nothing is going to work. Basically, after 12 hours from the time I washed my hair, my scalp felt "clean" and not oily as compared to the days before I used the products. As for the Overnight Vitalizer, if you are like me who dislike to apply anything to the hair. I would suggest you do not leave it overnight. I applied as what was instructed on the packaging, I totally dislike the feeling of my hair having a coat of oil on it. It gave me a very oily and heavy feeling on my hair. I left it on my scalp while I went to continue with my chores and washed it off after an hour because to leave it overnight is a no-go for me. Guess what? After washing and drying, it was just like as if my hair had a an intensive mositure treatment. My mane felt so much softer, the frizz was better to manage and I could easily run my fingers through the hair without having to break them. and if you are looking around for products to help with hairloss, you might want to BioRoyale Hair loss Solution a try. It comes with a starter set at $49.99 and the rest of the products can be view and purchase at www.Bioroyale.com . 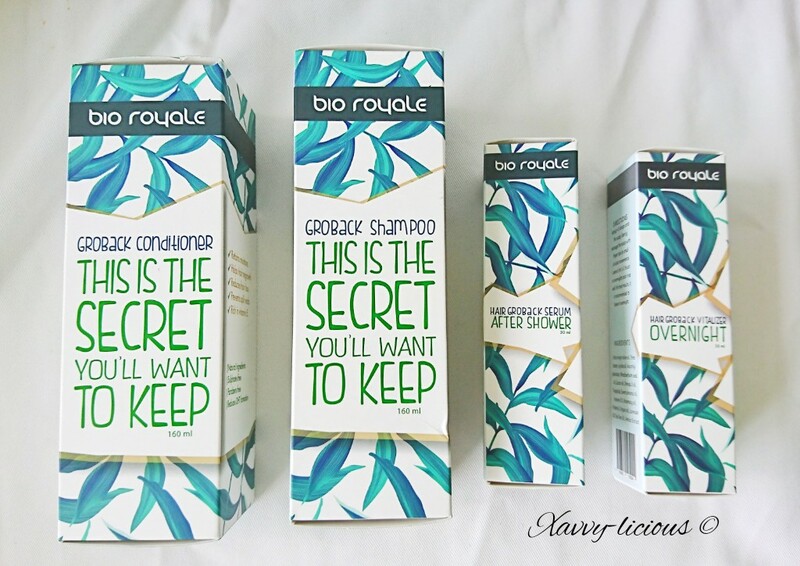 [Giveaway] If This is the secret you'll want to keep, BioRoyale has kindly sponsored a set of start set worth $160 to one lucky reader of Xavvy-licious. Should you wish to own this secret, simply follow the Rafflecopter. - Follow Xavvylicious on Instagram to earn extra entries. - Contest runs from 23 February to 1st March 2017 and ends at 2359 hours. - Contest is for residents residing in Singapore only. - Any incomplete entries will be disqualified. - All winners will be notified by email, after winners have been selected. 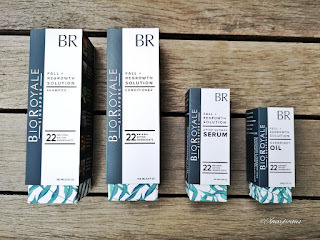 Disclaimer: I received a set from BioRoyale for review purpose only. No monetary compensation is involved. All opinions are of my own. Nicole: Thank you for your support ! Good luck and hope you be the lucky one !